The Ducorps Corella or Ducorps cockatoo is a small species of cockatoo. It’s feathers are white with a pink accent around the bill. The crest is relatively small and white. The feet and beak are bone-colored. The latin name for a Ducorps corella is Cacatua ducorpsii. In nature this species can be found on the Solomon Islands, next to Australia. This species is most related to the Goffins Corella. Best kept in cage or aviary? The Ducorp’s Corella occurs only on the Solomon Islands next to Australia. They live in woody forest areas and do not visit open fields as often. 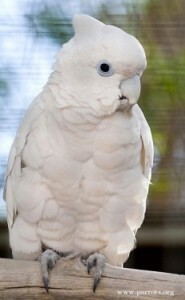 Ducorp’s Corella’s are common as pets. They thrive as companion birds in houses, but are also very content in an avairy. Usually they are quit and docile, but of course also this species will make a lot of noise when it feels like it. When these birds are used to humans from a very young age, they will become very affectionate to humans. A Ducorp’s Corella can learn to imitated words and sounds, but they are not very good at it compared to parrots.